Last Friday, I finally pulled the trigger and have as my main phone, an iPhone 4S on Sprint. My previous phone was a Palm Pre, which had it’s share of issues over the almost two years I carried it, even though I’m a fan of the webOS experience. If you remember previous posts, I had an iPhone before, but it was not my main phone, used mostly on wifi. So far, I’m quite impressed with this marvel. I’ve yet to scratch the surface on new features like Siri, but once I do, I’ll be sure to talk about my experience here. So now, I have officially joined the ranks as a full time iPhone user. One of us. One of Us! ONE OF US!! Yes… I feel part of the club, officially. As the rookie, you have to buy lunch for all us veterans. Got your credit card ready? A girl in my class has one and said that if you tell Siri you are drunk she will pull up a list of cabs nearby. That cracked me up, but also is pretty practical. My kids have a lot of fun asking siri random things. I hope you enjoy yours! Yeah, I tried that the first day I got it. It said there were 5 taxis near me. And my wife’s granddaughter had fun with it the other night after I showed her how it reminded me when her birthday way (that day). Siri remains just a novelty for me, only use it when people ask “hey, how does Siri work?”. Love the camera though. My goodness, hell of an upgrade from a 3GS huh? Yeah, the 3GS I had was white and I liked it a lot. 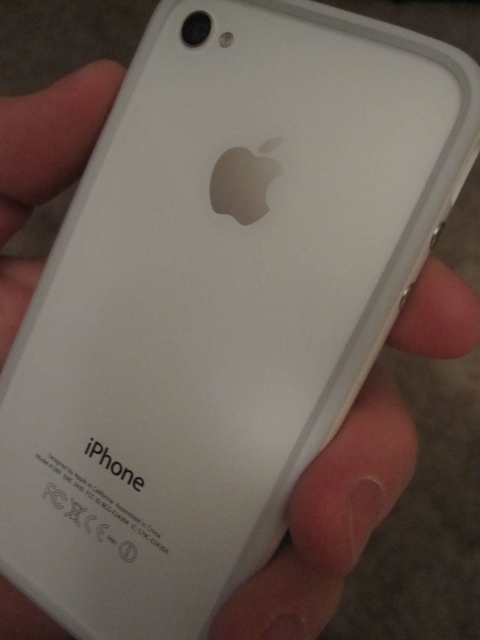 So when I saw how well the white 4S looked with the white bumper, it instantly was the coolest phone I’ve ever owned. I hope to integrate Siri into my texting while driving. As for camera, it’s quite the upgrade, that’s for sure. Flash, 8mp and HD video. Don’t forget to download grinder! The screen on your EVO is nice and big… much bigger than my Palm Pre was, that’s for sure. I’m telling you, this speed of this iPhone is killer. I have been trying to find an excuse to go from my iPhone 4 to the 4S because the Siri concept intrigues me. I can’t make myself do it yet, though. I’m interested in what you think of her. I am doing a Siri blog post soon (with video) that covers my use of Siri so far (in the 2 weeks I’ve had this phone). It’s mixed, but I’m growing to like it as it learns how I use things.